I'm changing my classroom theme! 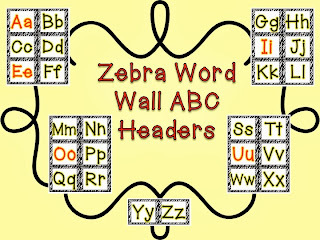 I decided to go with the Zebra pattern and have been busy making these ABC headers for my word wall. I read somewhere that the color yellow is very appealing to the eye. There are numerous big companies that have chosen this color in their logos. For example, Mcdonalds, Shell, Kodak, DHL and many more. For this reason I added a yellow glow to each letter. All vowels are red but they still have the yellow glow. I can't wait to use them in my classroom! Here they are for you Zebra loving bloggers!